Walk into Dean McLeod’s studio and your reaction to his artwork is likely to be a verbal and visceral “wow”. You are struck at once by the paintings visually deceptive spaces and the rich color of the saturated canvasses. Objects are depicted in a style that could be termed as “contemporary representational”. Handmade frames adorn each painting. 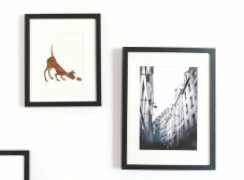 Built from a wide variety of materials, the frames are an integral part of the artwork. Born in Eston, Saskatchewan. McLeod grew up on a wheat farm, where the prairie wind and big sky seared his soul. The rebellious and free thinking culture of his family is evident in his artwork. His father set a life’s course for him with the regular advice, “It doesn’t matter what you do just be happy”. So, he never felt compelled to follow anything other than his heart.